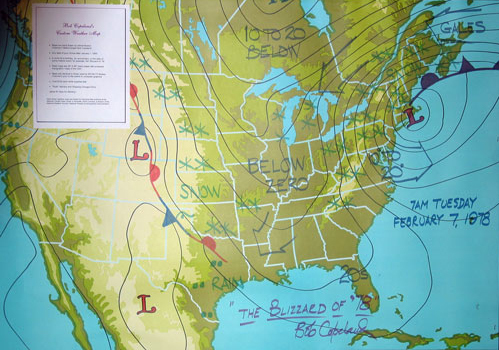 Order a Custom Weather Map hand drawn by Bob Copeland for any date you choose since 1888! These colorful collector's items are replicas of the maps Bob used on Channel 5 prior to the introduction of computer graphics around 1980! These maps make an ideal gift for the family "weather nut" - choose the date of a memorable weather event like "The Blizzard of 1978” or how about a permanent reminder of your anniversary or your sweetheart's birthday! Original maps: $495. Very limited quantity. The original base maps are heavy 36" by 48" custom-made silk screened topographic maps of the United States, with the meteorological “big picture” hand drawn by Bob to show the fronts, "Highs" and "Lows," isobars and other items of interest. Order your custom hand-drawn weather map for your special date on one of these great old maps. Smaller size maps: $195. Now featuring a smaller version of our custom weather map which is less costly and easier to frame. These base maps are exact copies of the original base maps, but the size is 18" X 24" (fits standard frame sizes with or without matting) and the finished map is similar in all respects to the larger map. “Blizzard of ‘78” Prints: $100. Due to ongoing demand, we are making available very nice limited edition prints of the “Blizzard of ‘78” weather map (18” X 24”) as shown, signed individually by Bob. Important Information: Allow 30 days for delivery; extra charge for rush delivery. All Custom Weather Map orders are payable in advance; checks, credit cards or PayPal accepted for payment. Contact Bob to order. All maps will be signed by Bob on request; buyer must specify date and any special inscription desired. Map prices are quoted unmatted and unframed. Finished maps may be picked up at our Littleton NH address, or shipped (add $15 S&H) in a heavy cardboard mailing tube via USPS Priority Mail or UPS. All custom weather maps are based on historical meteorological data archived at the National Climate Data Center in Asheville, North Carolina, a division of the National Weather Service.